This story was too funny not to share, and I don't claim to own the rights to this clip it belongs to MSNBC. It was so adorable though and I just had to share. 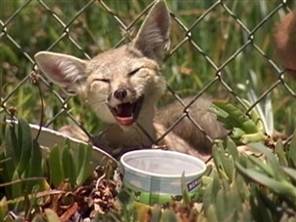 This is the Kit Fox, who was once so threatened in America and has an endangered subspecies called the San Joaquin Kit Fox. These guys are often mistaken for baby Coyotes and shot or harvested for their fur. Although how can you think this cute little face is a coyote? Look at that smile - definitely a face anyone could love!